Welcome to Soul & Flow! If you're here then you're curious about "this thing" called Reiki and the benefits associated with a life-changing practice. Reiki has played an invaluable role in my own life healing much of my own pain and alleviating struggle. The struggle is real, right?! I started Soul & Flow to help others experience the physical and mental gains of this practice so that they can step into life feeling their strongest. From headaches to anxious minds, Reiki helps to alleviate these unwanted conditions and improve wellness. It really is a win-win. As a Reiki Healer/Master I work with my hands using a light touch to heal your affected chakras and charge them with positive radiant energy, leaving you on cloud-nine. Most Reiki healers have a method that makes their practice unique, and Soul & Flow is no different. From my love of crystals to my affection for essential oils, I enjoy experimenting with different ways to make the experience as powerful as possible for you. In our sessions we might use specific stones to help balance your chakra systems and boost vibrations. Essential oils are another favorite Soul & Flow modality, as they assist in raising frequencies, and can help relieve physical pain. Guided chakra journeys, chakra and light meditations are also a common staple at Soul & Flow. Of course we all have different needs, and therefore I strive to make each of your sessions unique and rewarding. Intuition and experience guide me through our sessions, to create a tailored experience that will leave you feeling balanced, rejuvenated and clear of blockages found in your chakras, that can create havoc on the body and mind. Ok, so are you ready to clear out the clutter, get back that glow and let that beautiful soul flow? This site is packed with info for you to start and when you're ready, a quick way to book your sessions! You can even explore the idea of becoming a reiki practitioner yourself with Soul & Flow's Reiki Level 1, 2, 3 Trainings! Los Angeles Based Reiki Healing Services to Help you find your Zen. Reiki is a Japanese technique for stress reduction and relaxation that also promotes healing. 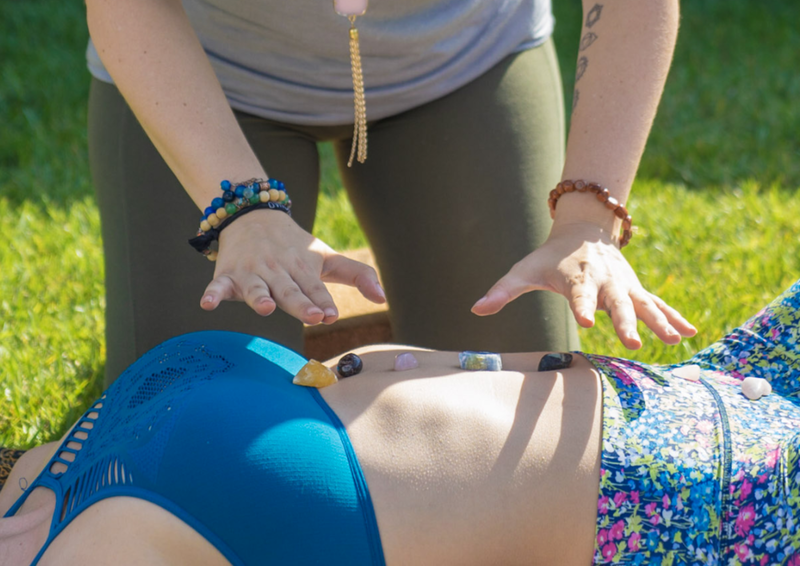 It involves the transfer of energy from practitioner to patient through the hands to improve the body's natural ability to heal itself through the balancing of chakras. The practice is based on the idea that an unseen "life force energy" flows through us and is what causes us to be alive. If one's "life force energy" is low, then we are more likely to get sick or feel stress, and if it is high, we are more capable of being happy and healthy. The word Reiki comes from two Japanese words - Rei which means "God's Wisdom or the Higher Power" and Ki which is "life force energy." Therefore Reiki is "spiritually guided life force energy." A treatment for Reiki feels different for everyone, but one common report amongst clients is feeling a beautiful and peaceful energy that flows through and around them. Reiki treats both the body and the mind and delivers many beneficial effects that include relaxation and feelings of peace, serenity and wellbeing. Reiki is a simple, natural and safe method of spiritual healing and self-improvement that anyone can use . This healing technique has been used to treat various ailments including headache, colds, migraines, strains and sprains. The technique also helps with stress, depression and anxiety. The Cancer Society of American recognizes Reiki as a safe, complimentary cancer therapy. Their studies acknowledge that reiki induces relaxation, lowers the heart rate and reduces stress, in turn promoting better faster healing. Reiki's founder, Mikao Usui is quoted as saying that "the mind and body are one." As we continue to study, the world of science is beginning to understand more fully, that the two work hand in hand. Brainwaves and body pulses and their role in stimulating healing can all be measured with today's technology, allowing the concept of Reiki, as spiritual energy, to be more widely understood by the medical community. Soul & Flow offers you an escape from a world that can sometimes be full of chaos. Every session with Reiki Master, Laura, is designed to calm your anxiety and melt away stress. Crystals, healing music and a serene quiet setting all compliment your custom reiki session. Expect to leave Laura feeling on cloud nine and ready to ride your soul's unique flow through the rest of your blissed out week. What are you waiting for? Laura also offers other healing services including group meditation parties. Get the skinny on all her services here. After dealing with an unexpected loss in my family and personal problems, the stress and emotional turmoil truly unbalanced my life. I was unable to sleep for four days. I went to Laura seeking help, and her loving demeanor and caring touch throughout my Reiki session restored my calm. I felt lifted in a way I hadn’t felt since childhood, and I also slept for 10 hours that night and the next night. I will continue sessions with Laura because she brings me to my zen. Who needs self-destructive stress relievers such as Xanax and alcohol when I’ve got Laura? After experiencing a strange foot injury, Laura suggested I try Reiki to alleviate the pain. Although skeptical, I decided to give it a try, and was completely surprised that my pain disappeared. I was so happy with the results that I booked her for a Reiki session the morning of my wedding, to help with the stress and anxiety any bride might feel on the morning of her special day. Laura listened to how I was feeling and put my body and nerves at ease. After our session I felt completely calm, relaxed and ready for one of the biggest days of my life. What are you waiting for? It's time to treat yourself to elevated health and happiness, book a service today. It's easy and faster than standing online at Starbucks. Laura offers evening and weekend appointments to fit your busy schedule. Find peace and reconnect to your inner soul flow - you'll be so happy you did.